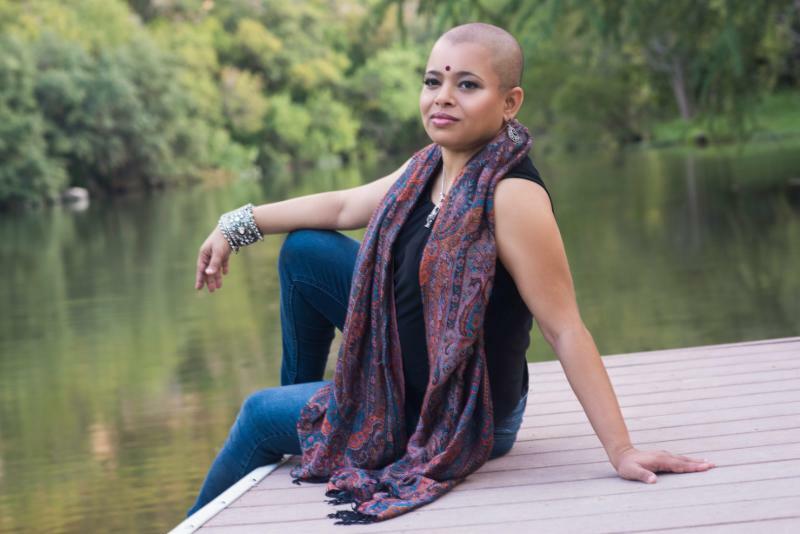 (AUSTIN, TEXAS – Jan. 15, 2019) – Today, Eastern Soul songstress Nagavalli premieres the second single from her upcoming album “Immersion” with foundingAUSTIN Magazine, titled “Ram Naam Ras Pije.”To check out the premiere see here. “Immersion” is set to be released this Jan. 18 and can be purchased on iTunes. There will be an official album release show this Sunday, Jan. 20 at the One World Theatre located at 7701 Bee Cave Road, Austin, Texas 78746, in honor of the Women’s March happening that weekend. Doors open at 6 p.m. with a pre-show acoustic set by Raina Rose held in the lobby of the theatre. 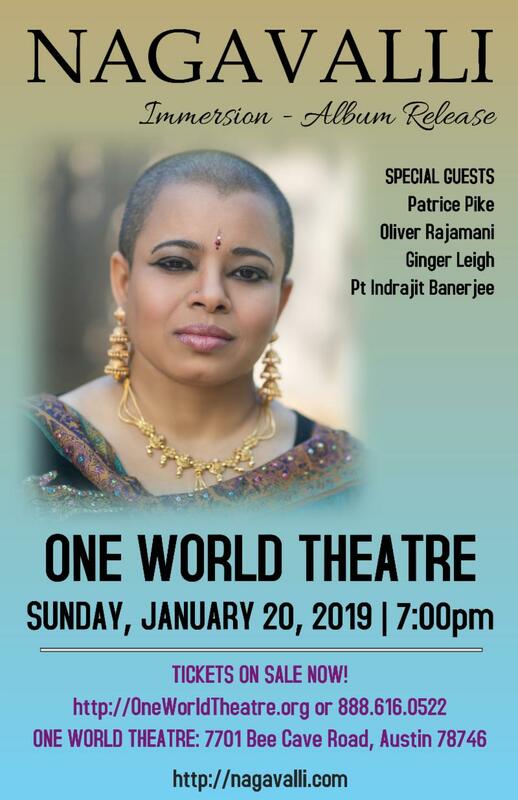 Nagavalli’s show will begin at 7 p.m.Special guests for the show include Patrice Pike, Oliver Rajamani, Ginger Leigh and sitarist Indrajit Banerjee. Tickets for the show range from $35 to $55 and the show is open to all ages. To purchase tickets, please go here. For information about the artist, please see www.nagavalli.com. Nagavalli’s music, described as “Eastern soul with delicate touches of pop, rock, trance and pure Eastern tradition” blends Western melodies and instruments with traditional Eastern overtones, vocals, sitar and percussion. The result is executed with such power and emotion that Valli’s music is unique, yet familiar and it often results in the listener achieving a state of meditative tranquility. “Immersion” is a back-to-roots journey for Nagavalli, channeling the spiritual and devotional quality of traditional Indian music. As the title of the record suggests, it is meant to have an immersive, meditative quality that is only enhanced by a continuous format, as each song seamlessly transition together. However, listeners will still have the ability to skip between tracks. The new album presents music from the rich spiritual and devotional music tradition of India. Songs on the record feature lyrics from ancient Sanskrit chants and writings by ancient saints such as Sant Kabir (1440–1518: Kabir was an Indian mystic poet and saint whose writings influenced Hinduism’s Bhakti movement and his verses are found in Sikhism’s scripture Guru Granth Sahib) and Meera Bai (1498 – 1546: Meera Bai was a Hindu mystic poet of the Bhakti movement, born into a Rajput royal family in India; legends about Meera mention her fearless disregard for social and family conventions, her devotion to Lord Krishna, her treating Krishna as her husband and her persecution by her in-laws for her religious devotion). “Immersion” was recorded at Austin Signal by Jon Niess and Don Harvey,with Harvey co-producing the album with Nagavalli. The album was mixed and mastered by California-based award-winning producer/engineer, Ben Leinbach. The record features a variety of musicians who take on an eclectic arrangement of instruments. These musicians include Indrajit Banerjee on sitar, Stefano Intelisano on keys and synth, Gary Newcomb on pedal steel, Jason McKenzie on percussion, Chris McQueen (Snarky Puppy) on bass, Shiv Naimpally creating a tabla loop, and for the finishing touches, Don Harvey added in cymbals with Jon Niess working up beautiful drones and Ben Leinbach adding temple bells and effects as well. East and West co-mingle harmoniously in Indian-American, Austin-based musician, Nagavalli. Nagavalli’s music, described as “Eastern Soul”, blends east-Indian soul with delicate touches of pop, rock, trance and pure eastern tradition. Nagavalli’s repertoire ranges from her original songs in English to East-Indian and Sufi spirituals, creating sounds both unique, yet familiar, which often results in the listener achieving a state of meditative tranquility. “Nagavalli’s voice and spirit give me the depth of experience I long for in music and rarely reach,” says Eliza Gilkyson, renowned Austin-based folk musician. Nagavalli grew up in Mumbai, India, bringing the rich, soulful music of her home to Austin, Texas where she has worked with musicians from a variety of genres such as Latin, American rock and jazz to middle-eastern, Indian classical and folk music. Named one of the Top 10 Female Vocalists and World Music artists at the 2015-2016 Austin Music Awards, Nagavalli has become a staple in Austin music circles, recording and performing with such artists and bands as Oliver Rajamani, Atash, Govinda and Ginger Leigh. 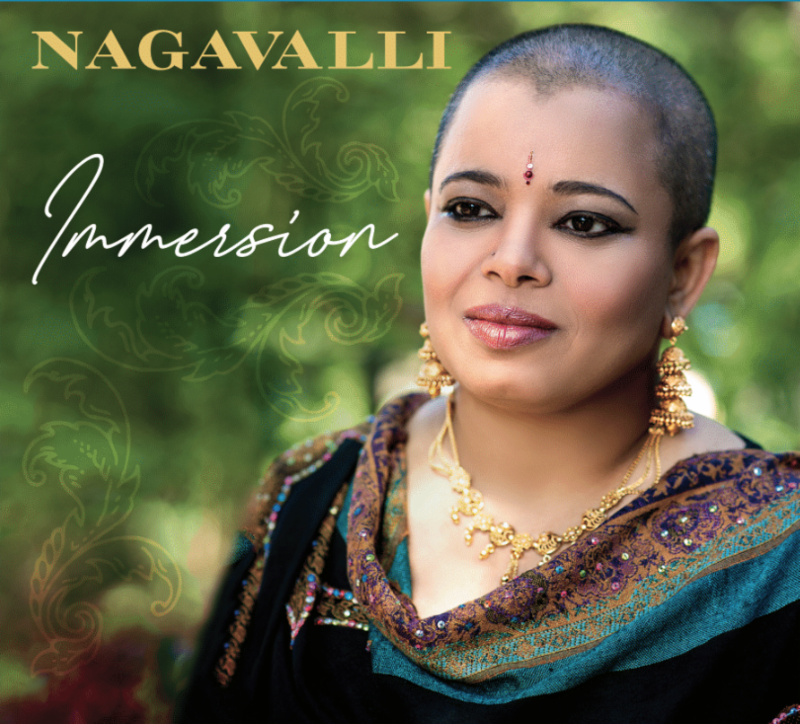 Nagavalli embarks on her next musical journey with her forthcoming album “Immersion”, out January 2019. The album is a back-to-roots journey that was composed as one continuous piece of music, with lyrics from ancient Sanskrit chants and the writings of such ancient saints as Sant Kabir and Meera Bai. For more information please see www.nagavalli.com.